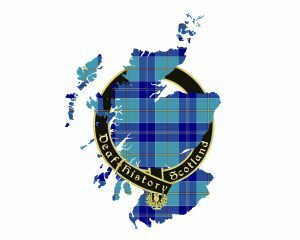 Deaf History Scotland’s Scottish Deaf History tartan is due to be launched at the AGM 2018 / 10th Anniversary Celebrations! The tartan, designed by Silvia Maria Cera when a textiles student at Heriot-Watt University, was created to celebrate the passing of the British Sign Language (Scotland) Act in 2015. Silvia based her design on the colours of the Sign Union Flag, designed by French Deafblind artist Arnaud Balard. She added Saltire white to give this international emblem a Scottish twist! Silvia donated the tartan design to Deaf History Scotland to help raise awareness of the value of Deaf heritage and to fund our projects with and for the Deaf community.